South America is full of beautiful places, amazing forests and urban areas as well, it is close to the US and most of its countries are relatively cheap. So maybe you will like this Los Angeles to Managua flight for $499 r/t with taxes included. Travel with Aeromexico in late January 2015 and save more than $40 compared to all the other airlines that we have found today. We have found this Cheapoair deal while searching on Travelgrove. If you are wise you will check some of the other providers as well to see if any of them has got an even cheaper flight to Managua. This flight, as you can see on the screenshot, will depart from Los Angeles International Airport (LAX) on January 22 and returns four days later from Augusto C. Sandino International Airport (MGA). The flight has a stop both ways in Mexico City, for 3 hours 19 minutes and then for 4 hours 40 minutes. 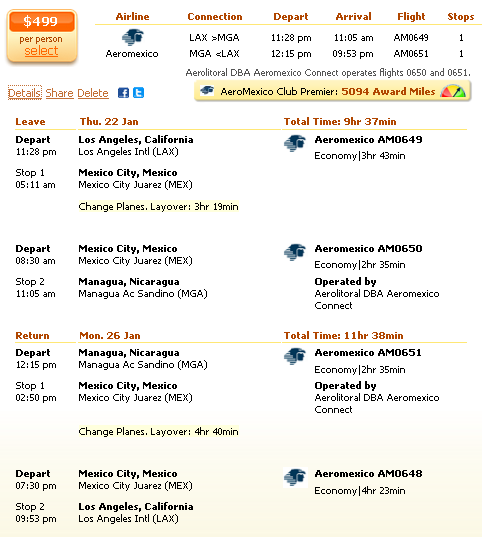 Aeromexico Club Premier, the airline’s frequent flyer program will give you 5,094 award miles if you book this fare. As you can see in the table, Aeromexico provides the cheapest flight from LA to Managua, it costs $499 r/t. The next best fare, a Copa Air deal, costs $542 r/t and it is $43 more expensive. This entry was posted on Saturday, November 29th, 2014 at 8:57 am and is filed under Airfare Deals. You can follow any responses to this entry through the RSS 2.0 feed. You can leave a response, or trackback from your own site.